BIRDS are just wacko. The old cartoons tried to tell us that. There are things going on inside of things in this paragraph that would basically send a junior high schoolteacher to the morgue. These sentences are the very stuff of "evil". 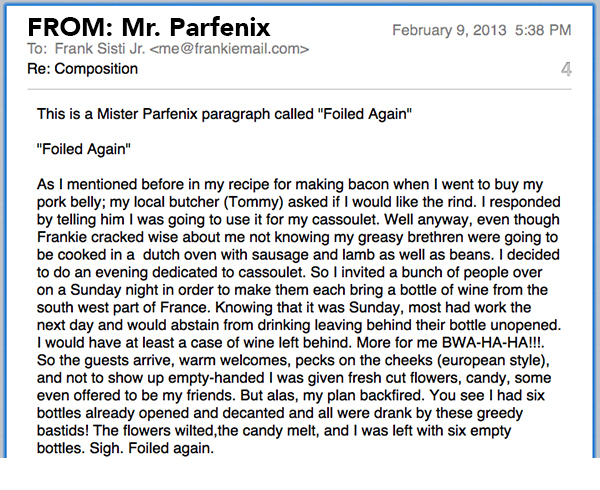 Mr. Parfenix truly is the most diabolical pigeon I've ever known. A master of his craft -- his craft of being an ARCH-BAD-GUY. "Well anyway, even though Frankie cracked wise about me not knowing my greasy brethren were going to be cooked in a dutch oven with sausage and lamb as well as beans." What's going on in this sentence? It's evil pigeon trickery I say! In a previous post I mentioned that Mr. P obviously didn't mind eating other birds. So while he's trying to zap me for that he's also trying to hep us to what else is in his cassoulet. An underhanded move! Now that's SUPER-VILLAINRY. I'm serious. And the dutch oven. There is something truly sinister in the mention of the dutch oven. It is a beacon to the forces of darkness, I assure you. This is code for an old school ruse Mr. P has been performing on Rubbish and I for years. Pecks on the cheek. A rather birdish detail, wouldn't you agree? I wouldn't be surprised if it has some kind of subliminal quality. There's something off about it, if I could only crack the code!!! "You see I had six bottles already opened and decanted and all were drank by these greedy bastids." A devastating sucker-punch. Within the confines of this gloomy castle of a sentence lies Mr. Parfenix's plans to destroy the universe. While Mr. Parfenix alleged that he had planned to have the people that were coming to his party bring wine, he now is saying that he ALREADY OPENED SIX bottles of the stuff. Not only did he open them - HE DECANTED THEM. Why? Why? We must get to the bottom of this! We must come together and form a Carrie-of-Homeland-style Voltron robot to figure out the evil machinations of the Homeland-terrorist-character Abu Nazir -- I mean -- Mr. Parfenix -- Why did he OPEN and DECANT six bottles of wine when he alleged that he was trying to OBTAIN wine from the others? WHY? WHY? WHY? This means that they would have had to bring more than SIX bottles of wine, for him to start reaping the benefits of his MASTER PLAN. Which can only mean that there is some OTHER PLAN at work here. This is a red herring, a distraction, a decoy -- FOR THE REAL PAIN THAT IS TO COME. It lies in the decanting, I'm sure of it. The mention of the South West Part of France -- that's a clue as well -- but the decanting -- and SIX BOTTLES. It doesn't fit. Something is going on. The entire Apartment Building is in danger! I'll need to get a lot of bubble wrap. I really think you're onto something here. I've entered Mr. P's email, a photo of him, all of your conspiracy theories and a few of your cheap mystery paperbacks into that busted old word-processor in Piss Alley by the park. After 20 minutes and a few kicks, the screen read "MYSTERY SOLVED! MR. PARFENIX IS CRYING FOR HELP". So I guess he made Cassoulet and got drunk again. Doesn't he do that every Sunday? I like how you couldn't resist leaving two comments on this one.